Thanks to the rebounding real estate situation, his company, which previously developed Vintage Ranch off of Puente Drive, will also start two other Goleta Valley projects in the next six months: The Boulders, which includes 16 homes on 15 acres along San Antonio Creek Road, and the Tree Farm project on the Cavaletto property nearly adjacent to The Knoll on Patterson, where 134 homes of diverse types (including 24 affordable units, a combination of “workforce” housing, and low-income rentals) will be spread across 26 acres. The latter project was the most controversial, taking 12 years of planning until being approved in 2012. At The Knoll, 11 of the homes will be market rate, ranging from about 2,500 to 4,200 square feet and estimated to cost upwards of $2 million, and one 1,200-square-foot home will be an affordable unit. The development at 533 North Patterson Avenue is on a former avocado orchard that has not been maintained since 1991, and surrounds the 7,000-square-foot mansion, which was designed in 1936 by the then-prominent architectural firm Edwards and Plunkett, who did the Arlington Theatre and original Santa Barbara Airport. 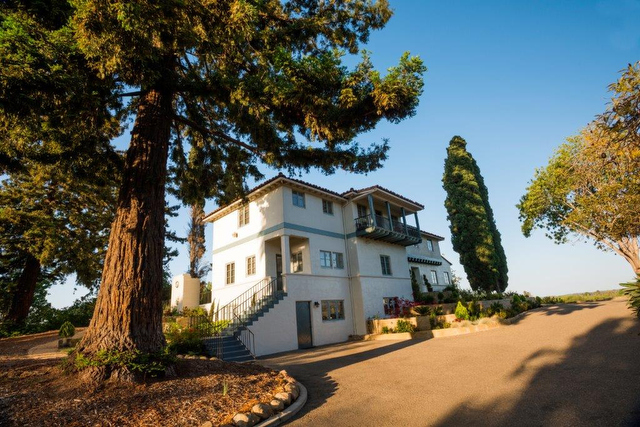 The mansion was built for the Rochlitzer family, who had escaped Austria in what Nelson calls a “true Sound of Music story” and decided to live in the heart of the sprawling orchards than then made up the Goleta Valley. It was sold in 1951 to Wayland Balcom, a commercial fisherman from Alaska who built a South Pacific tiki bar that still stands today. In the 1970s, David Palmer, who worked on defense projects for General Research, purchased the property. Nelson got involved with that family around 2007, won the development approvals in 2008, and his Oak Creek Company purchased the property a couple years ago. The mansion is being restored as part of the project, and will also be offered for sale when the homes are ready. Grading is expected to continue into the fall, and then construction will commence, homes are expected to be on sale and ready for touring next spring. More information about these projects can be found at oakcreekco.com.